Assuming whimsical gods favor your continued existence, there eventually comes a time when the bulk of our lives lies in the unalterable past. Compensation for this injustice is said to be “wisdom.” And though it’s not a fair trade, wisdom for youth, it beats the cold earthen alternative. Something challenging to do, in a place that inspires me to do it, and a friendly face or two with whom to do it, that's all I need. 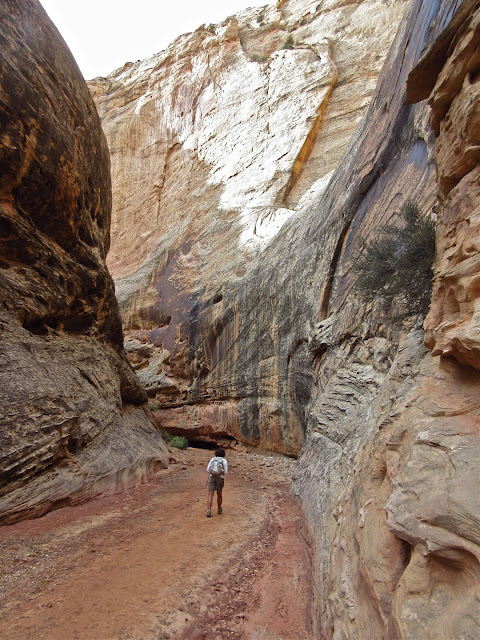 We stay out of slot canyons when rain is in the forecast, for obvious reasons. But what about when the Weather Guessers get it wrong, like on the day this family got caught in Little Wild Horse and captured this flash flood Video? Good thing it was a "light rain." 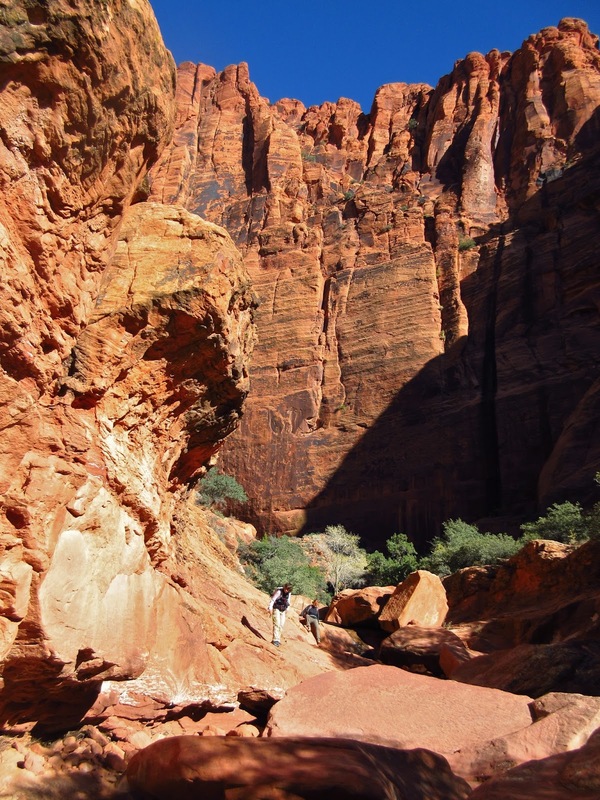 Another gorge-ous day in Virgin, Utah. Sun was full throttle and the breeze as light as our spirits. Chris and Suzanne had yet to do the Monkey Walk, so we took a picnic lunch of smoked turkey drumsticks and headed up to do a little dance around the edge of the ledge that separates life from death. I rode my bike, of course, and met them across from the super secret Government Compound for Research and Development of Weapons of Mass Destruction. My opinion, you understand. Why else would there be 8 foot fences with barbed wire, "Danger Keep Out" signs every 25 feet, locked gates, and funny noises emanating from within? What a difference a (wet) year can make. Bobbie and I have noticed that several of our canyon hikes feel brand new this time around. "Catch a wave and you're sitt'in on top of the world," especially if the wave is red and warm. In the distant west, Pine Mountain lay hidden under a mantle of clouds, clinging remnants of a one day storm that gave abused feet and legs a day off from work, er, "play." The hike up Many Pool's canyon(s) can be as easy or hard as you feel like making it. But one thing is for sure, it is a slap-in-the-face gorgeous trek. East Rim to Weeping Rock; "Who's Cryin' Now…"
It's an ambitious and exhausting hike, East Rim to Weeping Rock. 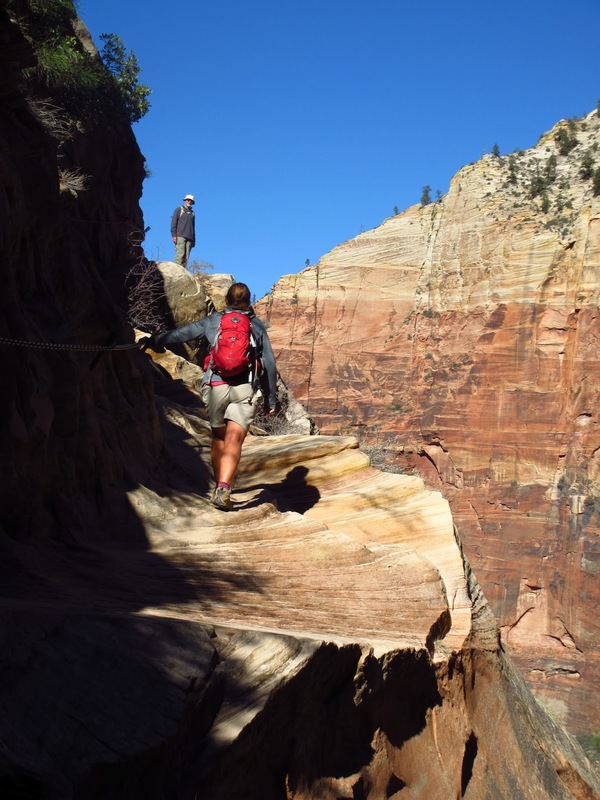 But, what's a life lived without challenge, adventure, and adrenaline? Highly overrated, I'd say. No one knows the grains of sand that remain in their "hour glass." Set your imagination free. It's never to late to add a few compelling chapters to one's story. When Jesus was treading around the Middle East in his Teva sandals, you know, healing the lame, raising the dead, and turning well water into a fine Pinot Noir (hic), there were more people (Native Americans, to be politically correct) inhabiting this area of Utah than now. For me, it's never been what I do so much as where. I'm not sure where that philosophy came from (my light-footed parents?) but I'm thankful for the leeway it brought to my life. It allowed me to set a course to unpopulated and oppositional places, where lowly deserts rub elbows with high mountains, and a life that suits my restless G-nome. If "home" is where the heart is, I'm there, 24-7-365. 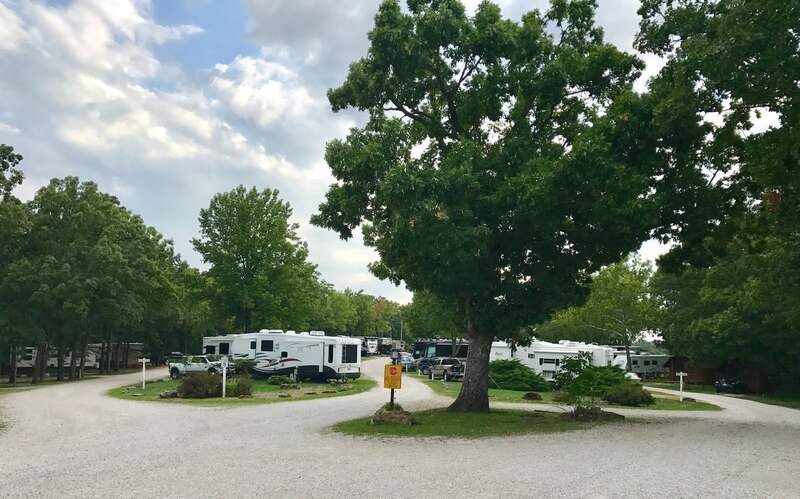 Osage Beach RV Park, Lake of the Ozarks, Missouri...Click on Photo for Link!